Scores of female protesters sit on the floor of a Senate office building to decry immigrants' treatment at the border. 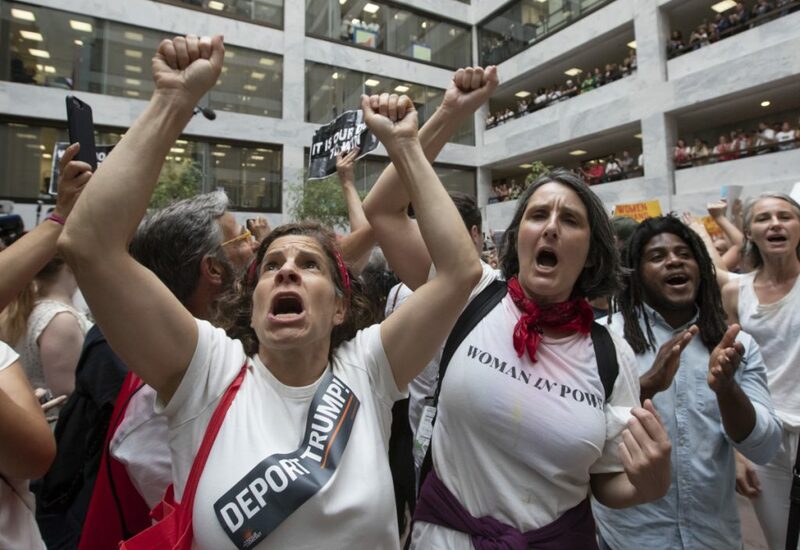 WASHINGTON — Capitol Police arrested nearly 600 people Thursday after hundreds of loudly chanting women demonstrated inside a Senate office building against President Trump’s treatment of migrant families. Among them was a Washington state congresswoman, the lawmaker said on Twitter. Amid unrelenting daily images of distraught immigrant children separated from parents and herded into fenced enclosures, women sat on the floor of the Senate Hart Office building’s 90-foot-high atrium. Seated around Alexander Calder’s black metallic “Mountain and Clouds” sculpture, they shouted slogans and cheered for a handful of fist-pumping lawmakers – all Democrats – who waded into the crowd. Winnie Wong, political adviser for the Women’s March, said the crowd’s fervor will translate into “the energy we will need to see at the ballot box in November,” when congressional control will be at stake. “We’re here to fight for our families to be free, to fight for the ability of our kids to be with their parents – not in cages, not in prison, but able to live their lives free, safe and secure,” Jayapal said.